Joe Owen was born and raised right here in Brevard, NC. From the age of ten, Joe has been working with his father building custom homes for their family business and for the past seven years has owned his own tree company. He decided he wanted to be able to spend more time with his family, so he took the position of Maintenance Director at Ridge Haven. He and his wife Crystal have three children and are active in their local church, where Joe serves as a deacon. You can see his love for the Lord in the way he treats those around him and through the intentional, quality work that he does. 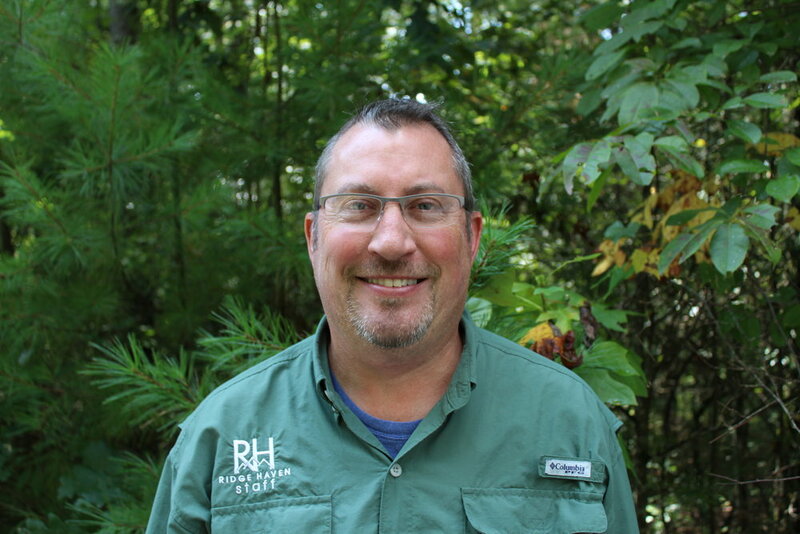 Jon Gunter joined our team in 2015 and is from the local Rosman, NC area. In his spare time, Jon loves to hunt and fish. Jennifer grew up at Ridge Haven as her mother, Rebecca, worked here for more than 20 years. Jennifer loves Ridge Haven and working here is a dream come true. Jennifer and her husband, Johnny, have a daughter, Grace. Jessie is from central Florida and a graduate of Covenant College. She and her husband, Todd, moved to Ridge Haven to join the staff in 2012 and were richly blessed by the five years they spent living and serving on Ridge Haven's Brevard campus. The Flemings now live in Durham, NC, but Jessie is often back on campus. Jessie played volleyball at Covenant, loves sports of all kinds, and has a huge heart for all furry animals-- especially their dog, Chester. Grace is a native of Nashville, TN. She attended Covenant College for both an undergraduate degree in history and a Masters degree in Secondary Education. After graduation, Grace joined the full time staff at Ridge Haven at the end of the 2015 Summer Camp season. She spent three summers on staff at Ridge Haven in various roles counseling and directing. Grace fell in love with the sounds and sights of the Blue Ridge Mountains, Brevard and Ridge Haven and is excited to call it home. When Grace isn't working at Ridge Haven, she loves getting crafty, discovering new music, and playing any game indoors or out. Grace is also a favorite among our guests: "Grace H. is the best game leader in the world!" Karina was born in Cuenca, Ecuador. She went to Catalinas High School and graduated from University de Cuenca with a doctorate in Law. She met her husband, Lee, while he was volunteering in the Peace Corp in Ecuador. They now reside in Brevard and have two children, Julia and Woody. "Uncle" Archie, as he is affectionately known by campers, is a longtime friend and speaker at Ridge Haven since 1995. He is the pastor of Greenwood Presbyterian Church in Greenwood, SC. He and his wife, Glenda, have five children and six grandchildren! We are glad to see Archie become a Pastoral Associate with us! Wesley was born in Montgomery, Alabama and grew up all over the southeast. He grew up participating in Ridge Haven's camps and was brought into faith while here. In high school, Wesley devoted his summers to serving as a CSI and found joy serving and assisting Ridge Haven in sharing the gospel. In his spare time, Wesley enjoys good coffee, bluegrass music, reading and the great outdoors. David is from Birmingham, Alabama and went to Covenant College in Lookout Mountain, GA where he recently graduated with a degree in Biblical and Theological Studies. Through friends at Covenant, David was introduced to Ridge Haven and worked for three summers as a counselor and CSI director, where he experienced profound Christian friendship and spiritual growth. He has grown to love the ministry, community, and environment of Ridge Haven that makes it such a special place. As a full time intern, he looks forward to the opportunity to invest in and serve the ministry that has had such a significant impact on his life. He is passionate about adventure and outdoor pursuits - when not working you will probably find him out hiking on one of his favorite trails or in a hammock with a good book! After visiting his parents, who retired to the Ridge Haven subdivision, Steve and his wife, Kelly, fell in love with Ridge Haven and decided they wanted to find a way to move to the area. A couple of years later Steve got a call from Ridge Haven asking if he was interested in a position here. Within two hours Kelly got a call asking if she wanted to apply for a position as the head operating room nurse at Transylvania Hospital in Brevard. They both were hired and their dream to live and work here came true. Steve and Kelly have three daughters here on earth, Rachel, Anna, and Cassidy, and one daughter in heaven, Bethany. Hailing from Myrtle Beach, SC, David and Regina retired to the local area several years ago and joined our team in 2017. Regina served in admissions offices at Coastal Carolina and Clemson University before coming to Ridge Haven. They enjoy playing with their dog Amos and love to hike during their spare time. Diane has lived in the local area her entire life, and joined our team here at Ridge Haven in the winter of 2019. She is married and has four children and two grandchildren. She spends her free time with her family and friends, and has three dogs and a cat. She is very happy and proud to be a part of our Ridge Haven team. Troy met his wife, Hope, while she was working for Wallace Anderson at MTW in Atlanta. They have two children, Elijah and Emme Kate. Thanks to the wonders of technology, Troy is able to work for Ridge Haven from Germany while also scouting and coaching baseball in Europe. The Williams family certainly misses being able to hike the trails at Ridge Haven! Cameron grew up spending his summers working at Ridge Haven. After graduating from Covenant College, where he met his wife Jeanna, he moved to Augusta, Georgia. While in Augusta, Cameron served as the Middle School Youth Director at First Presbyterian Church for two years. This past summer, Cameron returned to Ridge Haven to serve full-time as the Director of Operations. Prior to coming to Ridge Haven, Wallace worked at Covenant Seminary, Mission to the World, and Covenant College. He is married to Paige and they have three children, Kendi, Roy, and Cameron, all of whom have served as Ridge Haven summer staff.